Adler 4-Inch Centerset Single-Handle Bathroom Faucet in Spot Resist Brushed Nickel The MOEN Adler Single-Handle Low-Arc Bathroom Faucet is efficiently designed to meet WaterSense criteria, conserving water while maintaining peak performance. A single-lever design ensures easy use, while ceramic disc valves help further reduce water waste. The innovative Spot Resist finish in brushed nickel resists fingerprints and water spots to maintain its original brilliance and easily wipes clean, keeping it looking great over time. 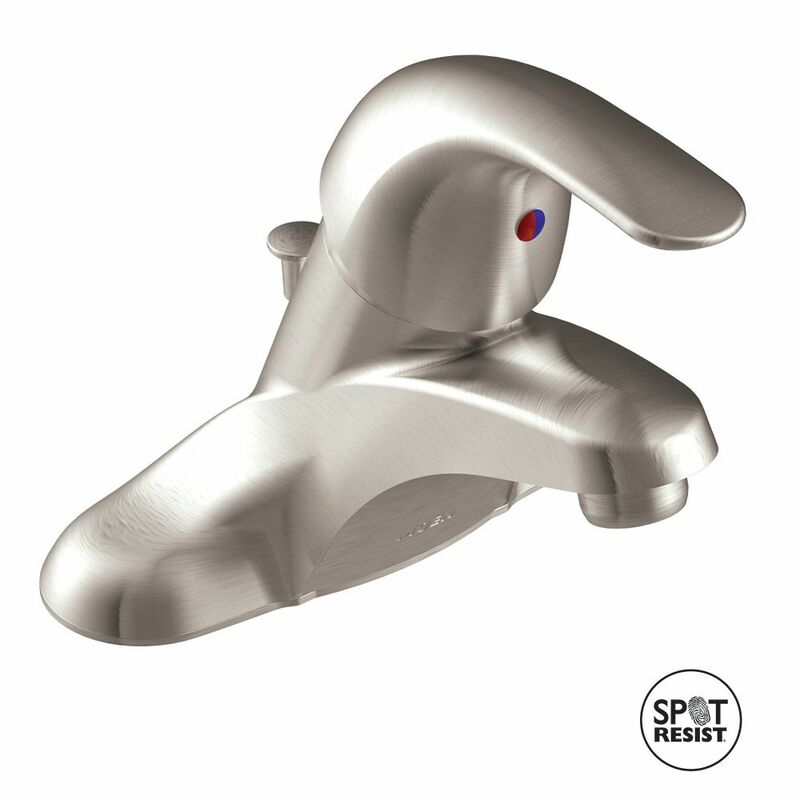 Adler 4-Inch Centerset Single-Handle Bathroom Faucet in Spot Resist Brushed Nickel is rated 4.6 out of 5 by 11. Rated 5 out of 5 by Mark from Easy installation no leaks.... Easy installation no leaks. Rated 5 out of 5 by Jeanette from It was to replace a 15 year faucet, so getting... It was to replace a 15 year faucet, so getting the old one out was an arduous task. This is a nice smooth design, does the trick. I like it. Rated 5 out of 5 by Fixitman from Easy to follow instructions. No special tools needed. Clean elegant lines. Love the no spot coating. Easy to follow instructions. No special tools needed. Clean elegant lines. Love the no spot coating. Rated 3 out of 5 by HomeDepotCustomer from Still working with Moen to get a fix for the leaking drain stoppers. Had several sets of parts se... Still working with Moen to get a fix for the leaking drain stoppers. Had several sets of parts sent out, none of which fit the product. Now waiting for completely new pop up assemblies. Where is this faucet manufactured? Does it have any plastic parts or is it all metal? I am dealing with extensive water damage in my home due to a faucet made in China with cheap plastic parts.